Dinner time with my family is one of the best and worst times of the day. It's the best because I love enjoying a quiet meal with my husband and daughter and talking about our day, but it's the worst because I don't always have the time to prepare a nice, nutritious meal. When these hectic days occur, we typically run to the nearest restaurant or fast-food chain, which can wind up being quite expensive over time. That's why I was thrilled to learn that there are other options available to make sure that dinner time is always a peaceful, joyous occasion which doesn't strain our family's budget and fits in with our busy lives. Let me introduce you to the Dinner is Ready Cookbook and Software Combo from 30 Meals in One Day! I reviewed the Dinner is Ready Cookbook and Software Combofrom 30 Meals in One Day, which retails for $39.95, but is currently on sale for $31.95. 30 Meals in One Day works on the premise of cooking an entire month's worth of meals in one day and then freezing those meals so that dinner preparation for the rest of the month is a breeze! Freezing meals in advance is not necessarily a new concept, for I can remember my grandmother talking about how she used to do that long ago. I've toyed around with this idea before, but always felt defeated because I simply didn't know which recipes were good ones to freeze, how to do it and how to organize my ridiculously long grocery list and kitchen counter when it came time to do the cooking. 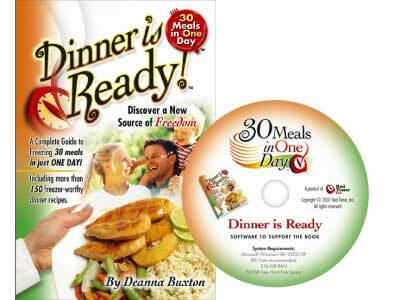 Thankfully, my prayers were answered with the 30 Meals in One Day "Dinner is Ready" Cookbook and Software Combo. 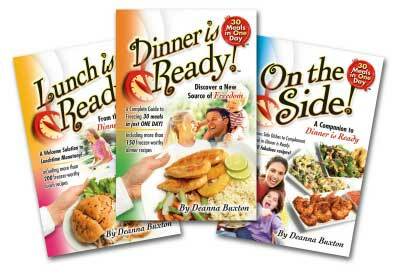 The "Dinner is Ready" cookbook is packed with more than 150 delicious recipes that every member of the family will enjoy. I myself am a VERY picky eater and dislike 80% of what's included in most cookbooks, but I can honestly say that almost all of the recipes in the "Dinner is Ready" cookbook appealed to me. There weren't any strange recipes with weird ingredients, and every single one of them is freezer worthy, meaning that they will taste as delicious from the freezer as the day you made them. Cook spaghetti noodles in boiling, salted water for the shortest time recommended on package. Drain. Mix warm spaghetti with eggs, Parmesan, butter and parsley. Press into a round greased foil pan. Mix sour cream and cream cheese. Spread on top of spaghetti crust. Sprinkle with Mozzarella. Brown sausage with onion. Add tomato paste and water. Simmer 10 minutes. Pour on top of cheese. Cover, label and freeze. 6 servings. To serve: Thaw. Bake covered for 45 minutes at 350. Uncover and top with Mozzarella cheese. Bake 5 minutes. Of course, what really sets the 30 Meals in One Day system apart from the competition is the software which accompanies this cookbook. 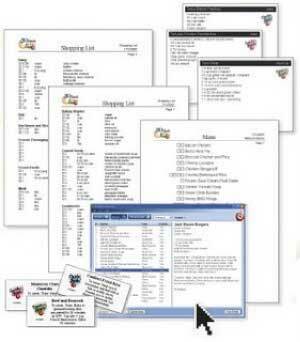 The software is an organizational powerhouse which will quickly and easily allow you to print shopping lists, monthly menus and even meal labels with preparation instructions printed on them. The great thing is that once you purchase the 30 Meals in One Day software program, you can use it with any of their other cookbooks and even download them directly into the software itself for a savings of up to 60% off the printed version. If you already have a collection of freezer-worthy recipes, the software program will allow you to add these in as well. The 30 Meals in One Day software is super easy to use and adds so much value to the cookbooks themselves. Now, choosing a meal plan and gathering the ingredients you'll need for your big day of cooking is as simple as possible. If you want to experience the best of both worlds at dinner time, then I highly recommend purchasing the "Dinner is Ready" cookbook and software combo from 30 Meals in One Day. With this unique and innovative meal preparation system, you can literally cook an entire month's worth of delicious, family-friendly dinners in one day, saving time, money and your sanity! :crazy: What a bargain! Disclosure: I received the Dinner is Ready Cookbook and Software Combo from 30 Meals in One Day in order to facilitate my review. No other compensation was received. This product review is based on my own personal experiences with this item and is completely honest and objective. Wonder if they would create a vegetarian version?